As most of you know, I will be leaving my post as the Schoolyard Gardens Assistant for Kansas City Community Gardens. 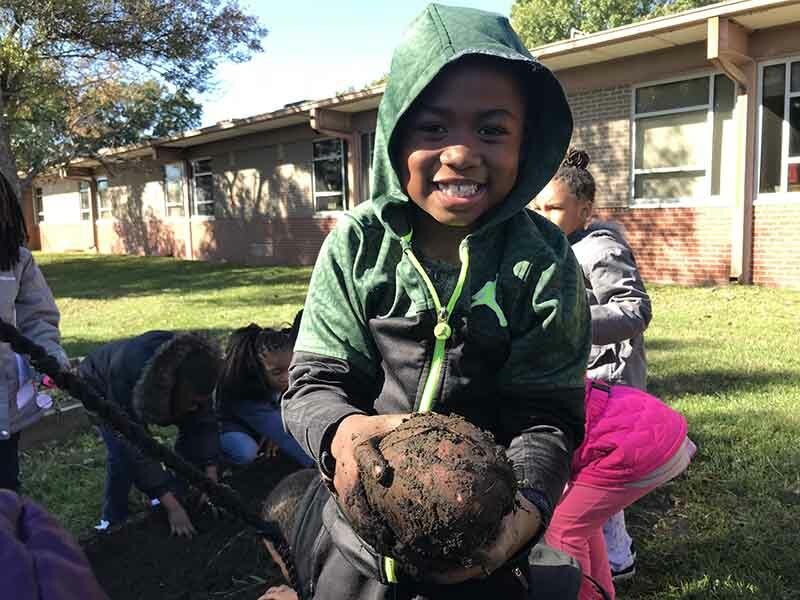 I began my time with KCCG as an AmeriCorps volunteer in 2015 and I started by working with just a handful of school gardens. As I stayed on at KCCG as a fulltime staff member, I began assisting more and more schoolyard gardens. The last few growing seasons, I’ve been helping over 60 schools plant, maintain and harvest from their vegetable gardens. When I started two years ago, I had no idea how much I would change, learn and grow at KCCG. I have had my most fun days at KCCG: laughing with students as they give pet names to their broccoli plants and search the leaves for cabbage loopers; getting some relief from the heat by watering the garden and looking the other way when students “accidentally” spray each other with the hose; hearing students yell “POTATO!” each time a new tuber is dug up from a raised bed; seeing the look on students’ faces when they pull up a radish or carrot for the first time, or bite into a fresh bell pepper or pop a cherry tomato in their mouths. My favorite part of the job has always been going out to schools and working with students. Planting times in the spring and fall are crazy—driving across the city, going to three schools a day (sometimes more), making planting plans, working with hundreds of students in Kindergarten through high school, and checking the weather (and the time) obsessively. It is a busy couple of weeks and the most exciting time of the season! 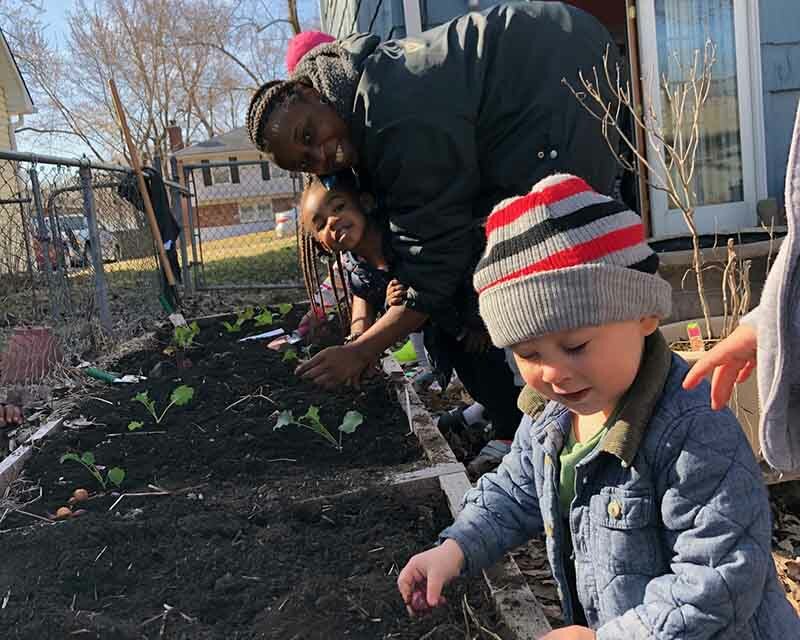 There’s something special about getting back to the garden and planting empty beds with new seeds and plants—students understand the season’s potential and are elated as they watch their vegetables grow. This job is chock-full of rewards, most of which come in the form of student joy, teacher excitement and vegetable bounties! MaryAnna and Crystal, my Schoolyard Gardens team members, have been two of the best people to work alongside over the seasons. They have taught me not only how to be a better gardener, but how to be more thoughtful, patient, driven, and most importantly, how to laugh the stress away! I’ve had so much fun with them, driving around town in the work truck, building gardens, adding compost to gardens, cleaning out beds and avoiding getting cut by rusty tomato cages! I have also had some of my toughest days at KCCG, in which we battled the cold during January garden constructions, or tried to tolerate the heat while shoveling hot compost in the middle of summer. Sometimes, gardens have disappointed. Teachers have left, weeds have taken over, or garden pests have gotten the best of us. But for every disappointment, there are hundreds of victories, big and small. I feel so lucky to have found such a unique program to work for in my hometown, where I met the most inspiring people and became more familiar with my city. I’ve especially appreciated working with the Kansas City Public School district and Kansas City, Kansas public schools, and I’ve learned the importance of supporting these school districts which serve many of Kansas City’s working class and low-income families. While I am sad to leave behind these flourishing gardens, committed teachers and enthusiastic students, it has been an honor working with every single one of you, and I will carry these memories, experiences and lessons learned onto my next adventure. Being your Schoolyard Gardens Assistant has been an incredibly rewarding learning experience that has altered the trajectory of my life and career. I wish the best of luck to my KCCG family and to all of the students, teachers, afterschool coordinators, parents and volunteers I have worked with while at KCCG. Thank you all for the enlightening, challenging, fun and inspiring experiences. I am so thankful to have been able to learn and grow alongside my students, coworkers, and our vegetable gardens! Previous StoryHot Work and Lots of Weeding Pay Off!